Two southern resident killer whales are ailing and are not expected to live, according to the lead demographer of the orca population that frequents Puget Sound. Two more orcas are ailing and probably will be dead by summer, according to the region’s expert on the demographics of the critically endangered southern residents. Ken Balcomb, founding director of the Center for Whale Research, said photos taken of J17 on New Year’s Eve showed the 42-year-old female has so-called peanut head, a misshapen head and neck caused by starvation. In addition K25, a 27-year-old male, is failing, also from lack of sufficient food. He lost his mother, K13, in 2017 and is not successfully foraging on his own. “I am confident we are going to lose them sometime before summer,” Balcomb said. Drone photography this past summer showed K25 to be noticeably thinner, and photos taken of him again in this winter show no improvement, Balcomb said. Several whales were documented to be pregnant back in September, but so far there has been no sign of any babies. The southern residents have not had a successful pregnancy in three years. The troubling news comes on top of a grim year in 2018 for the southern residents, the J, K, and L pods of fish-eating orcas that frequent the Salish Sea, which includes Puget Sound and the transboundary waters of the United States and Canada, as well as the West Coast of the United States. 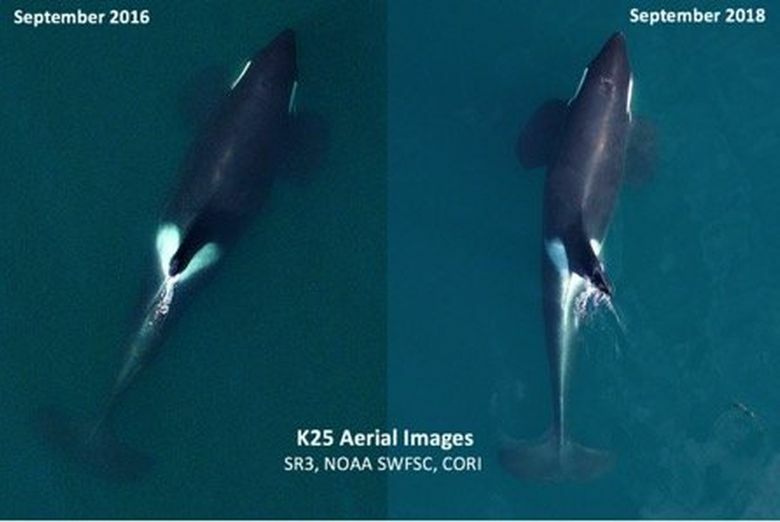 Losing J17 would be a blow to the southern residents because she is a female still of reproducing age, said Deborah Giles, research scientist for University of Washington Center for Conservation Biology and research director for nonprofit Wild Orca. As for J17, “that is the worst of those two, the thought of losing her, she is such an important member for the southern resident community,” Giles said. J17 is the mother of J35, or Tahlequah, who moved people around the world when in 2018 she carried her dead calf that lived for only one half-hour on her head for more than 1,000 miles over the course of 17 days. The family already has been through a lot. Drone photography taken this past September showed the southern residents went into the winter thinner than they were when the whales arrived in the San Juan Islands last summer. They also are thinner than the northern residents, which have been steadily growing in population for the past 40 years in their home waters primarily in northern B.C. and southeast Alaska, where they have access to more fish, and cleaner and quieter water. The northern residents gave birth to 10 new calves last year. The southern residents look particularly thin next to the seal-eating transient, or Bigg’s, killer whales. “They are like marshmallows,” Balcomb said. Ocean conditions and poor river migration, with warm water and low flows, have hurt chinook salmon returns in the past several years. Even Columbia River fall chinook, a bright spot by comparison in the region, came back to the river in such low numbers last summer that a rare emergency fishing closure was enacted on the river from the mouth all the way to Pasco. Only 186,862 fall chinook made it back below Bonneville dam in 2018, 65 percent below the 10-year average. Returns over Bonneville of jacks, or immature chinook, which can be a reliable predictor of this year’s return, were down to 61 percent below the 10-year average. Columbia River chinook are important to the whales because they are among the biggest, fattiest fish of all. The whales also target chinook returning to rivers in Puget Sound, and in the summer, to the Fraser River. Those runs have been declining as well. The whales’ behavior is changing as their food sources dwindle. They are arriving later and later in the San Juan Islands, because the Fraser River chinook runs they seek in those waters have so declined. The southern residents also are no longer often seen in large groups, in a pattern of feeding, then socializing, then resting before going on to a new spot. “They do not have enough fish to feed them, they are spread out all over, we never seem them like it was 30, 40 years ago, when they would travel and find fish, then be playful, then rest, then travel again, that was the pattern,” Balcomb said. 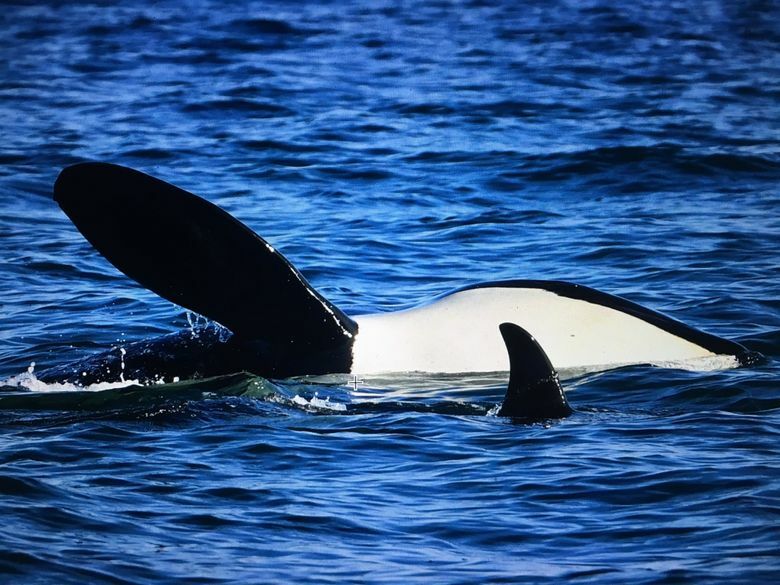 He said proposals put forward for the whales in the governor’s $1.1 billion budget for orca recovery, including a temporary ban on whale watching of the southern residents don’t go far enough.